The Palestinian Prisoners’ Society (PPS) has reported that Israeli soldiers abducted, on Wednesday at dawn, twenty Palestinians from their homes in several parts of the occupied West Bank. The soldiers conducted very violent searches of dozens of homes, and interrogated many Palestinians, before abducting twenty, and took them to various detention and interrogation centers. 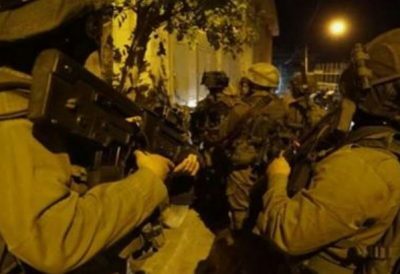 The PPS office in Nablus, in northern West Bank, said the soldiers abducted six Palestinians, identified as Yousef Awwad, Mohammad al-‘Azizi, Abada Tashtoosh, Qussai Hassan al-Bahti, Enad Mustafa ‘Aseeda and Rami Ahmad al-Kousa. In Jenin, in northern West Bank, the soldiers abducted Amir Emad Amer and Ziad Nasser Ja’as and Aysar Mohammad Amer. In Tulkarem, also in northern West Bank, the soldier abducted Amer Mohammad Assaf, 30, Ali Taqi Tawfiq, Mustafa Jamal No’man, 20, and Moath Fathi Khaseeb. In Hebron, in the southern part of the West Bank, the soldiers abducted Ahmad al-Baba Zama’ra, Yousef al-baba Zama’ra, Mahmoud Awad Zama’ra and Ata Hasan Zama’ra. In Bethlehem, south of occupied Jerusalem, the soldiers abducted two Palestinians, identified as As’ad Abu ‘Ashour and Ahmad Bassam Deeriyya. In Ramallah, in central West Bank, the soldiers abducted Bader Sari ‘Armoush.